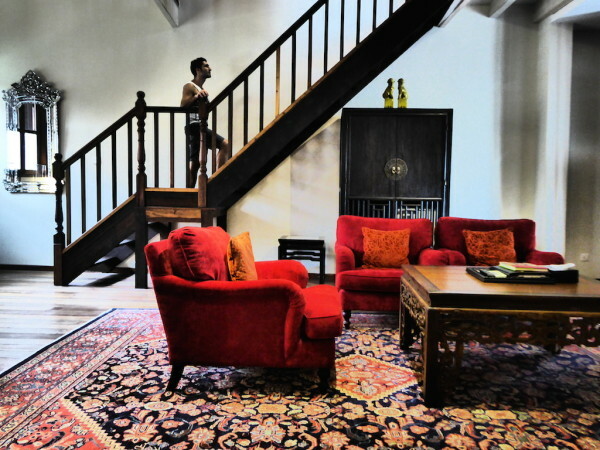 We always try to find places with bags of character while travelling and the gay owned Seven Terraces boutique hotel satisfied this nicely. 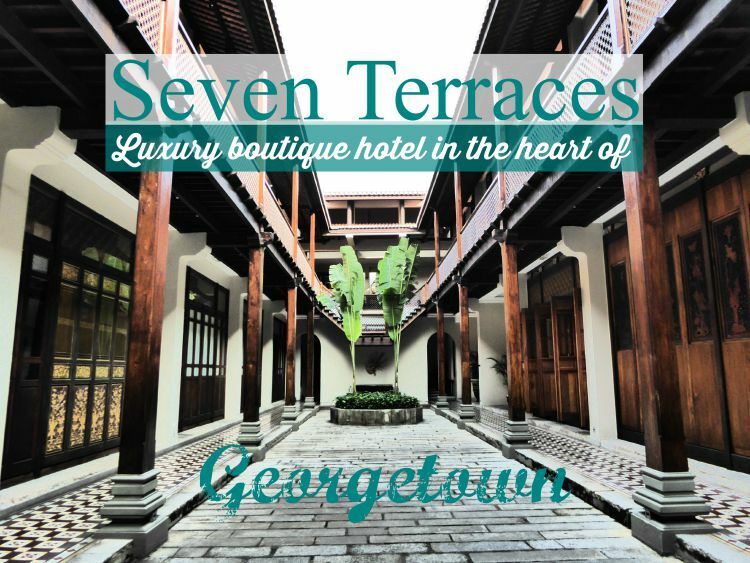 Seven Terraces is a luxury boutique hotel in the heart of Georgetown, Central Penang. 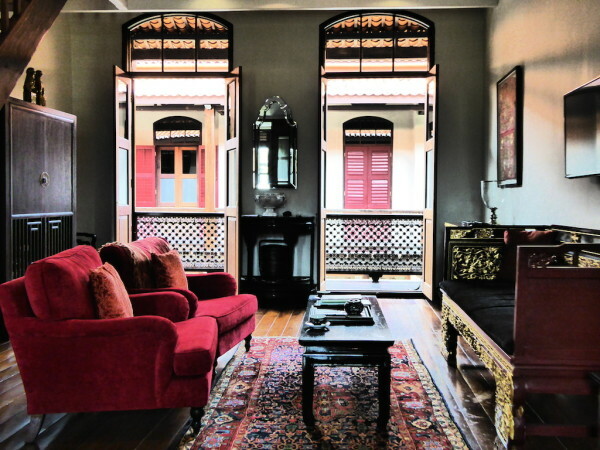 The owners converted what used to be a row of 7 Anglo Chinese terraces into 18 luxurious suites celebrating the Peranakan culture. Upon entering, you feel like you've been transported back in time to a different era, like in the Jodie Foster film set for Anna and the King (which although set in Thailand, was in fact filmed in Georgetown). 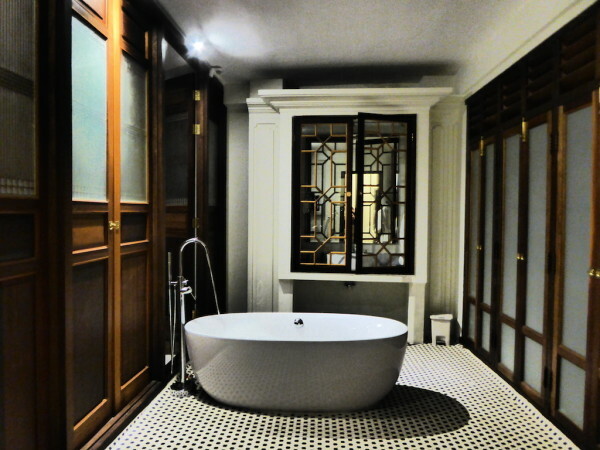 We stayed in the Grand Suite which comes with its own private terrace and gilded Chinese doors. The first thing that strikes you as you enter is the peranakan infuence such as the Chinese furniture and lacquered chinoiserie cabinets. It is also tastefully furnished with modern comforts including air conditioning, flat screen TV, rain shower and all important mini bar. 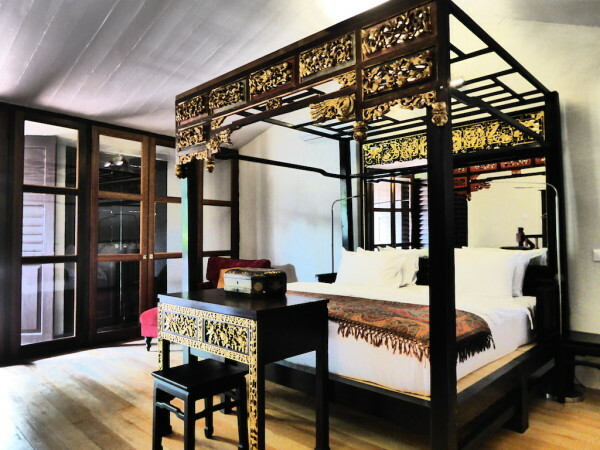 The main bedroom area is separately located upstairs with a private balcony and intricately carved Chinese four poster bed. Our grand mini palace also included a huge walk in bathroom area complete with rain shower and bathtub, leading to the private terrace. Seven Terraces has an outdoor pool, great for morning laps and trying out Biblical poses inspired by Michelangelo fresco paintings. 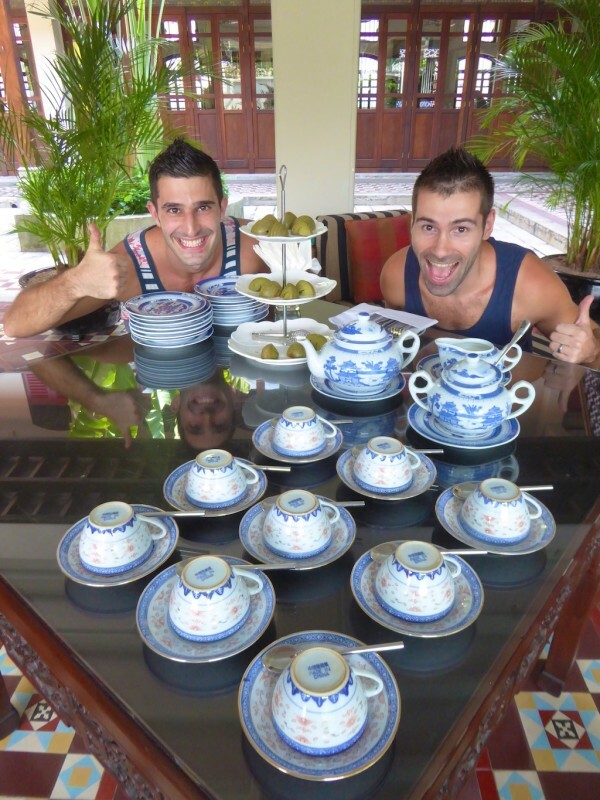 And in true colonial style, at 5pm every day, Afternoon Tea is served for all guests by the pool, complete with lots of tasty cakes to our delight. 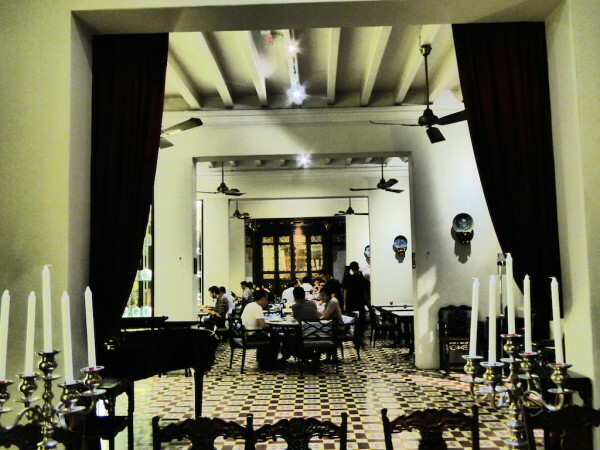 The in house restaurant called Kebaya, is just as stunning and jaw droppingly decorated as the main building, complete with grand piano live performance every evening – like something from Downton Abbey. The breakfast is hearty with a variety of both Western and local options available. 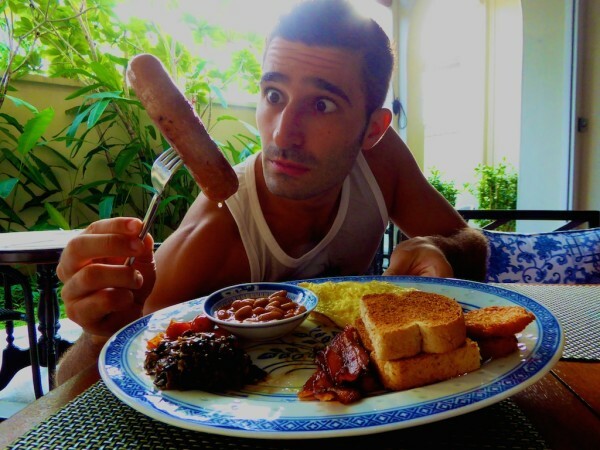 After over a year of eating our way around Asia, it was great to tuck into a Full English breakfast for a change, if anything for the, er, exquisite sausages on offer. And of course the staff are as pretty to look at as they are welcoming. Ewan the super friendly manager, is always on hand to offer both practical advice about the best things to do and see in Georgetown as well as show you the important happenings in the city each day. 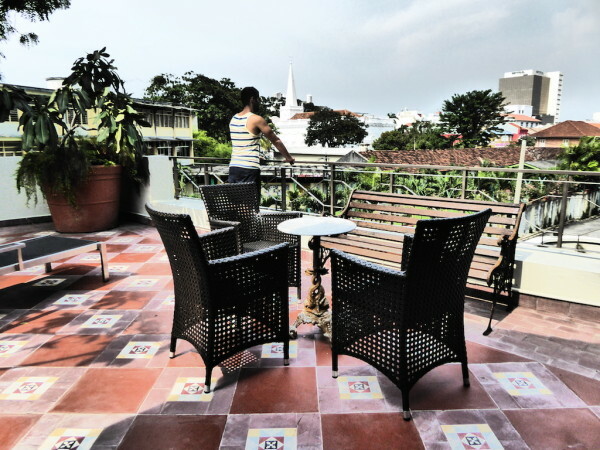 If you wish to book your a stay at this pink fabulous boutique hotel, you can check prices and availabilty here.